The International Monetary Fund's (IMF) new top economist affirmed the U.S. Federal Reserve's (Fed) move to pause interest rate hikes, warning of "considerable and rising" global risks and "weakening momentum." "The fact that the Fed has put a pause on raising rates is going to provide a lot of support to the economy," Gita Gopinath, who stepped into the position of IMF chief economist at the beginning of the year, told the Financial Times. Gopinath said the Fed's promise to be "patient" would positively impact the United States, on top of its lingering fiscal stimulus package. "We endorse the Fed view of having a data-driven approach," she said. Last month, with pressures on the U.S. economy rising — a global slowdown, a trade war with China, a nervous stock market — the Fed under Chairman Jerome Powell signaled it was in no hurry to resume raising rates after having done so four times in 2018. The Fed's decision has "certainly helped" emerging market economies that were hit by the clampdown in financial conditions last year, according to Gopinath. "Emerging market currencies depreciated a fair bit in 2018, and capital flows had really weakened. We are seeing some respite from both," the 47-year-old Harvard professor said. However, she warned that major concerns linger about global outlook, as eurozone and China in particular face rising threats. In January, the IMF lowered its global economic growth forecast for this year from 3.7 percent to 3.5 percent. The biggest cuts were in Europe, especially Germany and Italy. "In mid-2017 we had this cyclical recovery in the euro area after the big financial crisis… that looked good both on the investment side and the consumption side. But that cycle has turned much more quickly than many anticipated," Gopinath said. Gopinath also highlighted "tremendous uncertainty" around Britain's looming exit from the EU, expressing hope for a resolution soon. In regard to China's slowdown, Gopinath cited declining credit and the trade war with the U.S., urging the two economic giants to find a deal. 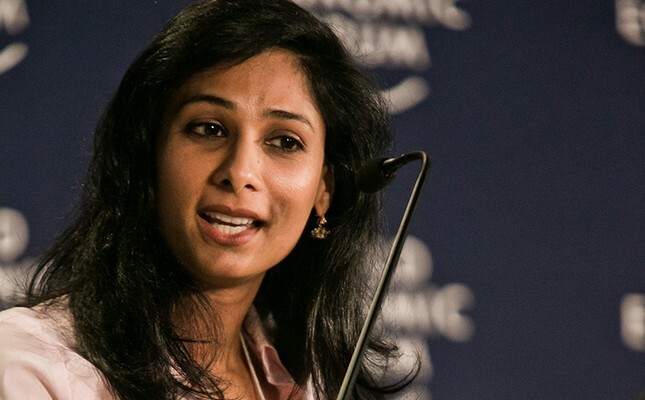 Gopinath, an Indian-born Princeton doctoral graduate, is the IMF's first female chief economist. She largely credits Christine Lagarde, the IMF's first female director, for her appointment. Lagarde on Sunday warned of a possible economic "storm" as growth forecasts dip, citing financial tightening, Brexit uncertainty and China's slowdown as major risks. "We have no idea how it (the trade dispute) is going to pan out and what we know is that it is already beginning to have an effect on trade, on confidence and on markets," Lagarde told the World Government Summit in Dubai.